Mueller gets another guilty plea & files more charges…. The related articles below in any of these part 1 sections always start off with the Russian investigation updates. The Mueller probe keeps steamrolling along, so far gaining 5 guilty pleas, 20-something indictments featuring 100+ criminal counts. This is BIG, but expect that the really BIG news is yet to come. More & more pieces to the BIG puzzle keep being put in place by the Mueller probe. We’ve already learned a lot, as we’ve got proof Russia did interfere in our election & continues to interfere, bombarding social media with false stories. Also the Trump campaign had numerous highly-suspicious contacts with shady Russians & were aware of the dirt the Russians had on Trump’s presidential opponent, which in some cases Trump’s staff even predicted the timing when the damaging emails would be dumped. The party’s platform was changed at the convention seeking to remove Russian sanctions, while Trump had & still has a bizarre infatuation with Putin where he’d never dare say a disparaging word. During his presidency, those nefarious Russian connections his team had been hiding became exposed, from which Trump & his minions repeatedly lied about those contacts & engaged in actions to obstruct the investigations. The more we learn, the worse it gets, & I do believe the worst of it is still to be unveiled. Expect that America & the world will be shocked when all the facts come out. In the headlines the past few days were Manafort & Gates. Remember, for a time Manafort was Trump’s campaign chair & attended that infamous meeting in Trump Tower with the Russians, so here he is facing very serious indictments. Whatever Trump personally knew of any of this, we still need to find out. So in the links below, it starts off with lots more charges against Manafort while his cohort Rick Gates pled guilty. Gates is playing ball with Mueller & the pressure is on Manafort to flip also. As Manafort still resists Mueller despite facing a life sentence, it may come down to whether Manafort can cop a favorable plea bargain, or is he holding out hope for a presidential pardon? I’ve heard some Trump opponents speculate if Mueller flips Manafort, it will be game over for Trump. Or it could come to pass the info Gates, Flynn, Papadopoulos & others are giving to special counsel, plus in following the various money trails, would be enough to provide the proof on the extent of conspiracy & obstruction charges at the highest levels of the White House. Stay tuned as we watch history-in-the-making, since, like a great mystery movie, the biggest drama should come at the end. But instead of some Hollywood fiction, this is real, & has real ramifications for our nation. Included among the related articles is Manafort’s new indictment as seen in new-manafort-indictment-alleges-secret-payments-to-european, plus there’s Gates pleading guilty as revealed here in lift-up-your-heads-o-ye-gates. This Gates story is another stepping stone to the bigger story: why-richard-gates-is-a-key-player-in-the-mueller-probe. From there the articles provide stories on Hope Hicks going before the House Intel Committee, others on we shouldn’t be surprised if certain congressmen someday get served with indictments, & then we see numerous links with reports on Mueller & the Russian attacks. The link robert-mueller-profile features a CNN video showing the personal traits & background of Robert Mueller, with a proven history of dedication & rising above partisan politics. Look at his impressive career. He’s a man of impeccable integrity & ethics. In fact, he is everything Trump is not: mueller-and-trump-born-to-wealth-raised-to-lead-then-sharply-different-choices. Negotiations between Mueller & Trump’s lawyers continue in trying to set up parameters for Trump to testify, but the lawyers are terrified knowing their client never tells the truth. So overall as the Russian investigation proceeds ahead, the risk for Trump is enormous. One Republican-leaning pollster, speaking on condition of anonymity, said the question is impossible to quantify with any certainty. To move that many votes in those three states, the pollster said, would mean moving about 600,000 votes nationally ― or about half a percentage point. That said, he added that Trump’s success in using WikiLeaks to hammer on about emails and thereby remind voters of Clinton’s biggest vulnerability ― the FBI probe into her emails ― clearly makes that kind of vote shift plausible. “I’m much more open to the notion that it mattered,” he said. Exit polling suggests that voters’ concern about Clinton and emails — and Trump’s pounding on that theme with the help of WikiLeaks in the final weeks — indeed made a difference. In Michigan, for instance, 60 percent of the electorate was bothered by the email issue, and 75 percent of those voters supported Trump. Relatedly, a quarter of Michigan voters settled on a candidate in the final month. That group broke for Trump 52 to 37 percent, while those who decided earlier voted for Clinton 50 to 47 percent. From the summer of 2016 until today, I have repeatedly warned about the Russian attack against American democracy; the Russian attempt to elect Donald Trump and defeat Hillary Clinton in 2016; and the strange and disturbing views of Trump toward Russian President Vladimir Putin. Several days ago, Thomas Friedman of the New York Times, who until recently has been far more tolerant of Trump’s behavior on Russia than I have, issued his own dire warning and call to action on the most important security issue facing the United States; better late than never. When Friedman calls for a code-red alert and charges that whatever causes Trump’s behavior toward Russia is dangerous and disturbing, he is right. Throughout official Washington, there have long been high-level conversations, including among prominent Republicans and Democrats, about what motivates Trump. Could Trump be the subject of blackmail by Russians? Could Trump be so lacking in knowledge about Russia and national security that he does not understand the danger of Putin’s attack against America and refuses to lead a condemnation of it or organize a program to defeat it? As Trump used to say about other matters, something is going on here, something wrong and troubling, something disturbing and dangerous to American security. It is shameful and dangerous to American security that while Putin attacks America, Trump praises Putin. It is dangerous to American security when our president moved from comparing the CIA to Nazi Germany as the CIA is battling Russian aggression to waging war against the FBI while that agency is batting against Russian espionage against America. Trump still does not unequivocally acknowledge that Russia continues to wage its aggressive war against American democracy. *launch a wholesale attack against justice in America by moving to fire Robert Mueller as his investigation produces more indictments, plea bargains and evidence of Russian plots against us. It is indeed time to issue a code-red alert. Every patriotic American should demand that our president stop praising the Russian dictator who attacks us and start faithfully executing the laws of the land. He must start protecting and defending our Constitution and security against any enemy who attacks us — especially Russia. America now ponders two remarkable questions. First, did a presidential candidate compromise our interests in exchange for electoral help from a foreign adversary? Second, once elected, did he obstruct justice in order to conceal his disloyalty? We must have answers. But, for the moment, let’s consider what we already know: how assiduously America’s president serves Russia’s interests. 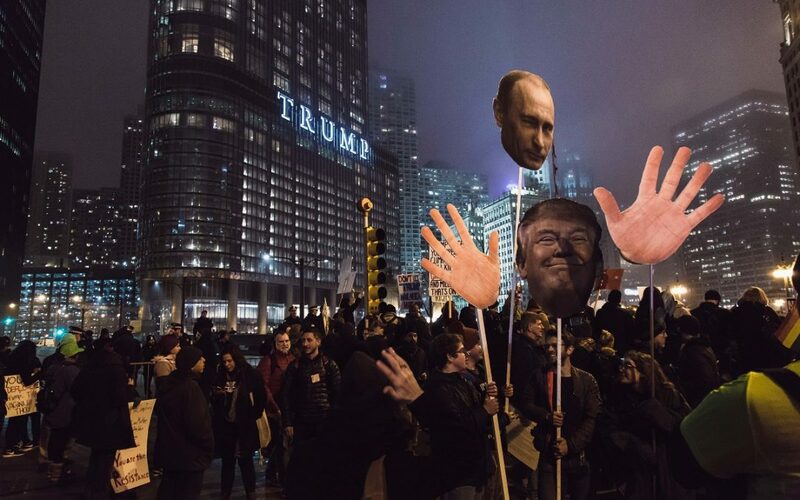 During the 2016 campaign, Donald Trump’s praise of Vladimir Putin evoked the slavish sycophancy of a Soviet-era puppet. As president now, Trump is equally servile. But Trump’s servitude is also substantive. He slights our allies and alliances, furthering Putin’s hopes of dividing the West. He ignores European concerns about Russian intrusion in their own elections. He airbrushes Russia’s invasion or harassment of its neighbors. He countenances Russia’s participation in Bashar al-Assad’s Syrian slaughter. His indifference to human rights mimes Putin’s. He has become the principal geopolitical asset of America’s foremost global adversary. Most disturbing, Trump still has done nothing to combat Russian cyberattacks or fake news campaigns ― let alone punish Russia for its brazen assault in 2016. Any other president would educate America about the threat we face, and rally our resources to thwart it. Instead, this president’s advisers fear that raising the subject will enrage him. Daily, Trump undermines our institutions and undoes our defenses ― encouraging Russia to escalate its assault. The most basic obligation of a president is to defend American democracy against attack. Trumps failure to do so is an inexcusable act of dereliction and disloyalty. But, to Trump, loyalty is owed to him alone ― excepting, apparently, his affinity for Putin. Offended by Democrats’ non-response to his State of the Union, Trump suggested that this was “treason.” As ever, he personifies projection. With each passing day, Robert S. Mueller III, the special counsel investigating Russia’s interference in the 2016 election, seems to add another brick to the case he is building — one more indictment, one more interview, one more guilty plea. Mr. Trump and his advisers insist they are not worried because so far none of the charges implicate the president. Yet no one outside Mr. Mueller’s office knows for sure where he is heading and the flurry of recent action seems to be inexorably leading to a larger target. “When you put that all together, the White House should be extremely worried,” said Benjamin Wittes, editor in chief of Lawfare. In the links on international worries, the tragedy of the Syrian civil war with lethal attacks on their people, where we’re also seeing American & Russian forces increasingly engaged in conflicts against one another. Moving on down to the despicable president category, one article shows Trump has legal jeopardy even beyond the Russian case: trump-org-lawsuit-goes-after-trump-as-private-citizen-report. Also in the category of Trump corrupts all around him, it looks like Melania’s friend made off with millions from the inauguration committee: melania-trump-ends-contract-with-adviser-whose-firm-received-millions. In the links to more Trump news at the bottom, we see Trump’s approval ratings have sunk to match his lowest levels poll-trump-approval-rating-drops-down-to-match-lowest-of-presidency. Other links show Americans trust Mueller far more than Trump, with ratings for having “little or no trust” in Trump being double the rate for Mueller. That same poll is split on whether Americans believe Russian meddling affected the outcome of the election russia-americans-trust-special-counsel-mueller-more-than-trump-usa-today-poll-shows. The far-right echo-chamber is relentless in their lying & deceit, as is always explained in part 2. To help counter that, we provide far-left Kos articles. Although over-the-top partisan & exaggerates their opinions, the Kos nonetheless are currently more accurate & will into the future continue to be proven more accurate than the fake news/conspiratorial-minded nonsense constantly emanating from the rightwing echo….